The BC-5390 is a five-part differential hematology analyzer with built-in autoloader and a single closed tube sample mode. The hemoglobin analysis is performed using cyanide-free reagent. 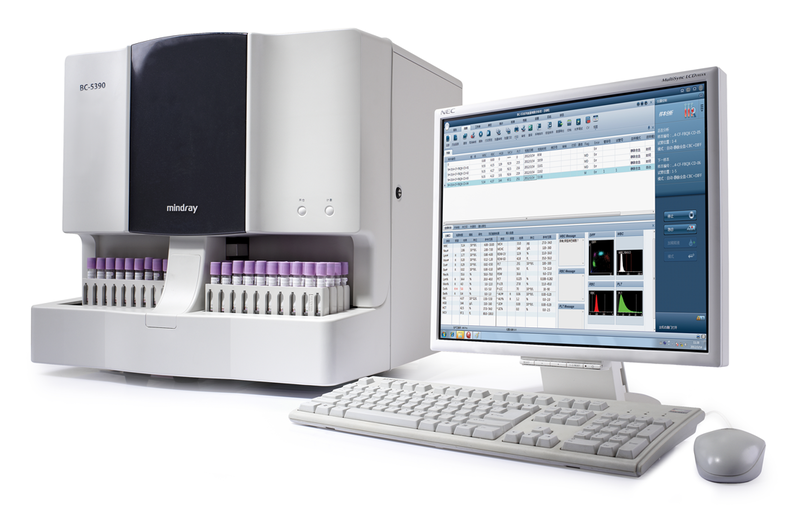 The analyzer processes up to 60 samples per hour and stores up to 100,000 results with histograms and scattergram. The barcode reader and optional LIS connectivity enable seamless sample data transmission. Nearly all scheduled maintenance procedures are automated by touch buttons. The intuitive software enhances workflow efficiency and provides operators with a pleasant user experience. Laboratories have long been facing multiple challenges, including clinical, operational and financial issues. The solution is to find the analyzer that best meets your lab’s needs and goals. Efficient, reliable, and easy to use, Mindray’s new BC-5390 is just what you want. It’s a compact, 5-part Auto Hematology Analyzer that delivers high productivity, better accuracy and improved patient care, without sacrificing your budget or space.